The holidays are a time of celebration and family togetherness. They also tend to be a time of over-indulgence and over-eating. After all, when you think of the holidays you likely think of things like putting up decorations, wrapping gifts, and what you are going to cook for your big holiday meal. As with most diets, portion control is key. Especially if you are eating items that might contain a lot of sodium, potassium, sugar, or other ingredients that are potentially dangerous when you have kidney disease, keeping your portions small is very important. If you are eating foods that have a lot of fat, sodium, or other not so great additions for a kidney safe diet, try to cut off the worst parts of the dish. For example, in casseroles that have rich sauces, try eating all of the vegetables out of the dish and leaving the extra sauce, cheese, and other toppings aside. Trim the fat off your meats, discard the skins, and overall just try to trim down. 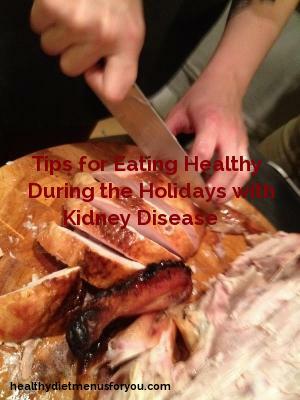 You can make some substitutions to your holiday meal so that it will still be enjoyable but still much healthier for your kidney disease diet. For example, skip the ham or roast beef and choose to eat a lean cut of turkey without the skin. For dessert, instead of potassium rich pumpkin pie, choose a more kidney safe dessert like angel food cake or a low sugar fruit pie. Your holiday meal will still be delicious with a few suitable substitutions such as these. – Use a smaller plate when filling up on holiday foods. This will help you keep those portions in control so you don’t overdo it. – Make sure to eat during the day before the big holiday meal. Have a healthy and light breakfast and lunch that day, so you don’t arrive for the big meal so hungry that you gorge yourself on too many unhealthy options. – Consider having a healthier themed meal. Get your entire family involved and set parameters, such as lean, low sodium and low sugar options and more healthy plant based side dishes. The most important thing to realize is that although the holidays are nice and important to you, your health is the most important thing. Remember that everything you eat or drink has to get filtered through your kidneys. As a kidney disease patient, you know the discomfort you feel when you aren’t taking care of yourself. Eating healthy over the holidays is not only safer for you, but it can be just as enjoyable. I hope you have a wonderful holiday season and stay healthy.